This article is from the May/June 1995 AFRMA Rat & Mouse Tales news-magazine. In their wild state rats are very social animals that spend a great deal of time in intense physical and mental activity incurred during the search for food. They don’t have the luxury of water bottles and lab blocks. Our pets may be domesticated but they still have the same mental and physical needs as their wild counterparts. Environmental enrichment is the intentional manipulation of captive animals surroundings to affect its physical and mental well being in a positive way. This relatively new approach to animal husbandry has been gaining momentum in the zoological field, but has the potential to affect the lives of all captive animals. Enrichment has two goals. The first is to increase the number of natural behaviors a rat exhibits. These include foraging, positive social behavior, and an increase in physical activity. The second is to decrease the number of unnatural or unwanted behaviors an animal exhibits. These might include pacing, self mutilation and companion mutilation (fur chewing, whisker biting, etc...), appetite loss, obesity, or aggression. Rats quite simply are designed to be very intelligent and active animals. A lone rat in a cage bare of all but the essentials of food, water, and bedding does not have the opportunity to express any of these basic rat characteristics. For some animals this has no visible effect and they live happy healthy lives. For others it may lead to unwanted behavioral problems. Besides preventing these problems, environmental enrichment encourages an animal to become more active and inquisitive, and can provide great entertainment for the animal’s owner. Enrichment usually causes a reduction of aggression between cage mates, mental stimulation of our naturally curious animals, and an increase in their physical activities. Basically, enrichment gives our animals something productive to do with their time, and can lead to healthier and longer-lived rats. Everyone who owns a pet rat is enriching it without knowing it. Every time you talk to your rat, clean its cage, and take it out for a romp on the couch, you are practicing environmental enrichment. You are encouraging it to move around, use its senses, and its mind. Unfortunately most of us can’t spend all day playing with our pets (as much as we might like to); therefore, the rat would utilize the best forms of enrichment in our absence. The ultimate in enrichment would be to let our rats run loose in our homes, but that would be unsafe for our pets, and impractical for most people. The following are some enrichment ideas I have used and found successful. I won’t guarantee everyone’s rats will love them, but they are the ones that I like best. They are i n no way original and you may find you are already using many of them, and had never thought of them as enrichment. A wild rat spends most of its day moving around in search for food. In contrast, our rats usually are served dinner in a nice dish. My rats typically rush to a plate of food in an attempt to grab the choicest morsel. This is when the most incidences of aggression occur, particularly between males. An easy way to eliminate this, and provide the rats with several hours of activity is to serve lab blocks in wire baskets (thus encouraging the rats to work for their food). If you feed a grain mixture, try lightly scattering it on the floor of the cage. The rats will spend several hours searching for the food, and since it doesn’t draw them all together at the same time, there is little aggression. Another good enrichment opportunity is to offer novel food items to your rats. Occasionally offering your rats a steak bone, spaghetti, fruit, or anything else out of the ordinary will perk a rat’s interest. This however can be overused, and if a rat leans to expect “goodies” with its dinner, the effect is greatly reduced. Rats can also become obese from overfeeding of treats. My favorite food related enrichment involves the use of what is sold as a “ferret roller basket toy” (Pets International LTD., Arlington Heights, IL 60005) and can be purchased at some pet stores. This is a hard plastic ball that looks very much like a large cat toy, and comes apart into two halves so you can fill it with food and then close it up. My rats will spend hours rolling the ball around to get the food out. As long as you make sure the food is in small enough pieces to eventually fall out, the rats will not chew on the ball. I have used dog food, broken banana chips, chopped vegetables, and chopped fruit all with success. 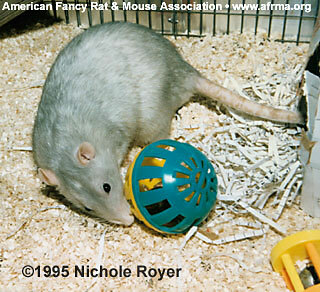 If the ball is just left in the rats’ cage, they will even play with it when it doesn’t have food in it. My rats roll the ball around, kick it, push it, and even pick it up and carry it around their cage. Wild rats are very social animals, and this has carried over into our domestic rats. As a general rule, all rats are happier and healthier if kept with a companion. They play, groom each other, and sleep together. You couldn’t ask for a better or simpler form of enrichment. I never house rats singly if I have a choice, and I prefer to keep them in groups of three or more. This can cause some problems. Female rats usually are not very aggressive towards other females. Male rats can be aggressive, but a lot of this can be eliminated by making sure they are in a large enough cage. Eliminating obvious situations that will provoke aggression (feeding situations are a number one cause of aggression). Yes, there are some rats that will not tolerate a companion. Often these are the male rats who also become aggressive towards people. Neutering will usually solve both these problems. By far the number one rat toy is the wheel. While not doing much for mental stimulation, wheels provide the maximum in physical exercise. I have always wondered how many miles my rats travel each night while running on their wheels. Unfortunately some rats don’t ever use the wheels. This seems to have a lot to do with whether they were exposed to wheels at an early age or not. For this reason I make sure all my baby rats are raised with them. There are many types and sizes of wheels out there, and for rats it’s a case of the bigger the better. It’s important to take into consideration what the wheel is made out of. Don’t buy wheels that are made of 1/2 x 1 inch mesh as they frequently will catch a rat’s foot and can cause injury. My rats have shown a definite preference for the solid wheels made by Fern Manufacturing, and I like them because they are easier to clean. Other good toys include those made for cats and birds. Hard plastic cat toys are sometimes played with by rats, and are usually the right size for picking up and pushing around. Watch out for toys with small parts or ones with easily chewable pieces (my rats love bells-to eat). Some rats use these toys; others ignore them. My rats find bird toys infinitely more interesting. Naturally these toys are considerably more expensive, so I usually only buy one of each type and rotate it from cage to cage weekly. Apparently our rats have many of the same needs as large parrots, because those toys are perfect. They are virtually indestructible, very interesting, and many have moving parts or goodies to chew on. Unfortunately, most toys made for smaller birds have small parts, and most rats would destroy them in a matter of days. Structures include a number of large items that can be put into a rats cage for its use and enjoyment. I have used ropes, ladders, and pieces of 2x4 all as climbing implements. Rats love to run around on these and will happily use them to get from level to level in their cage. Ropes and ladders can be purchased ready-made for birds and are excellent. The 2x4’s serve the same purpose and are much cheaper, but they don’t look as nice, and since they can’t be disinfected, you have to replace them regularly. Other structures my rats seem to enjoy include tunnels and hide boxes. I feel these are very important and are one of the best forms of enrichment you can give your animals. While they provide physical and mental enrichment, they also fulfill two important psychological needs. Hide boxes (or nest boxes) provide a sense of security, particularly for a sleeping animal. Both hide boxes and tunnels also provide visual and physical barriers between animals. This allows a subordinate animal to escape from the stress of being in constant contact with a dominant animal, and makes it possible for the loser in a fight to exit the scene before being badly injured. Hide boxes and tunnels go a long way towards lowering aggression between rats. 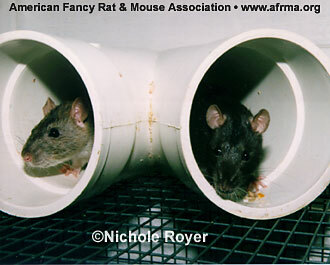 Tunnels can be made out of cardboard tubes or PVC pipe. Cardboard will be destroyed, but not before providing the rat with lots of fun. PVC pipe can be purchased in a number of shapes including curves, T’s, and Y’s. It can also be purchased in long lengths (this is much cheaper) and cut to whatever length is preferred. PVC has the advantage that it is almost indestructible and easily disinfected so it can be used for years.